A better belt - built for the best. 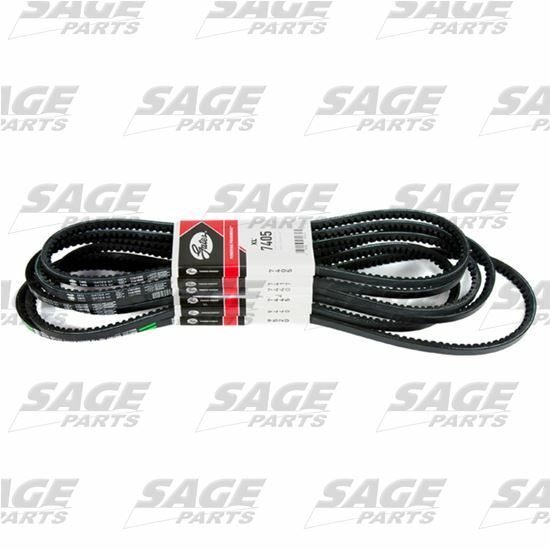 Gates replacement belts are made to withstand the most demanding engine drives. Due to thermal forces, this variable notched belt tightens on the drive as it gets hot. This results in improved belt performance by reducing tension decay and noise. Gates belts are fiber-loaded rubber stock which puts more flexibility along the length of the belt, yet gives the belt greater lateral stability in the pulley. When properly installed and tensioned, thermally active tensile cords yield maintenance-free performance. Form ground to ensure precise top width and sidewall dimensional control for proper fit in pulley as well as a smoother, quieter running belt. Meets or exceeds SAE J636C specifications. Do not use Gates belts, pulleys, or sprockets on any aircraft propeller or rotor drive systems or in-flight accessory drives. Those Gates products are not designed or intended for aircraft use. Use Gates products only on applications specified in Gates literature. Install and maintain products according to the vehicle manufacturer’s recommended procedures and with the recommended tools. Failure to follow these instructions could result in injury or property damage. Gates and Sage Parts disclaims all liability due to failure to follow these instructions.